Imitated by many, our original classic clog is versatile for men, women and kids. 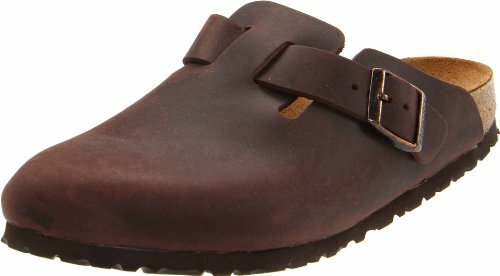 Going strong after 30 years, this clog is a wardrobe basic year round. Enjoy the closed-toe comfort and support. Features an adjustable strap for fit. Upper material: Leather - Thick yet supple leathers without additional dyes to keep the leather breathable, durable and comfortable. Footbed: The original Birkenstock footbed - Featuring pronounced arch support, deep heel cup, and roomy toe box. Footbed molds and shapes to your foot. Sole material: EVA - Flexible, lightweight, durable and shock absorbing.